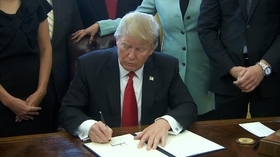 President Donald Trump's executive order to roll back Obama-era rules to address climate change will set back public health initiatives, environmental advocates said Tuesday. Trump on Tuesday signed an executive order that eliminates the Clean Power Plan, which aimed to reduce carbon emissions from power plants by 32% below 2005 levels by 2030. On its website, the Environmental Protection Agency projects the plan would result in health benefits that total up to $34 billion and result in preventing 3,600 premature deaths, 1,700 heart attacks, and 90,000 asthma attacks every year. A separate analysis of the plan published last June in the journal PLOS One estimated health benefits of $29 billion by 2020. Changes to the Clean Power Plan rule will require EPA Administrator Scott Pruitt to write a new rule, which could take years. But many saw Pruitt's appointment to head the EPA as a sign Trump plans to dismantle to agency. As attorney general of Oklahoma, Pruitt sued the EPA more than a dozen times. But while a rule might take a while to craft, other provisions within the order could have more immediate effect. One such measure tasks all federal agencies over the next 170 days with “identifying all regulations, all rules, all policies, guidance documents that serve as obstacles or impediments to domestic energy production,” said a senior administration official during a background briefing about the order held Monday. Another provision aimed at generating jobs would lift a suspension on federal coal leasing by the U.S. Interior Department. Experts however have said the rise in natural gas production is unlikely to generate a substantial number of mining jobs. Trump is also ordering agencies to disregard the environmental impact of their actions. The executive order overall reflects the administration's position to not take action on climate change. David Arkush, managing director of the Climate Program at the consumer advocacy group Public Citizen said that inaction could take years of work to reverse given the scientific evidence showing the impact of climate change. Other parts of the executive order would end federal funding to states and local municipalities aimed at helping them prepare for the effects of climate change, such as wildfires, extreme cold and heatwaves, which have caused hundreds of deaths across the U.S. over the past decade. Opponents of current environmental regulations praised Trump's order as helping to reverse Obama-era rules that they said worked against the country's economic best interest. The Obama-era rules raise electric rates for consumers significantly and do immense economic damage to the heartland states where U.S. manufacturing is now concentrated, said Myron Ebell, director of the Center for Energy and Environment at the Competitive Enterprise Institute, in a written statement issued Tuesday.